I am, to my eternal lament, cursed with a preference for grim, nihilistic stories which has endured since my earliest days with literature. My earliest book reports are on Slaughterhouse Five, Brave New World, 1984, A Canticle for Leibowitz, and other books involving a breakdown of the basic principles of life and morality. I don’t know – I guess I’m just an apocalypse junkie. In any case, this preference eventually led me (as it would) to Camus, whose L’Etranger is one of my very favorite books along with the book I am currently recommending, La Peste (The Plague). This is not a philosophy textbook, an exercise in existential theory like The Myth of Sisyphus. It can be taken easily, and not wrongly, as a gripping medical thriller with extended metaphysical ramblings. The characters are foremost, however; the plot proceeds, of course, but the real story is not found in the search for an effective serum. In brief, the setup is this: a strain of pneumonic plague begins to infect the residents of the walled coastal Algerian town of Oran. The gates to the city are shut and the populace must ride out the plague as it kills mercilessly and indifferently. 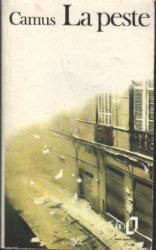 The parallels to existential philosophy are not obscured: trapped in a place where life is taken without reason, with no means of communication with freer souls, everyone in Oran is essentially in limbo – alive but with no reason to think they will stay that way, each person must face his or her death and the death of their loved ones and attempt to reconcile it with their way of life. That is where the meat of the story lies – in how the various people live under constant threat of death. Some succumb, some rage, some contrive to escape, but as days grow to weeks and months and the death toll rises and grows closer to home, there arrives a general feeling of apathy and vague, inescapable dread. Some boundaries in society are broken down – the rich are no less likely to die than the poor, for instance – but others are reinforced or created – the religious quarrel with the nonbelievers over the cause of the calamity. On that topic, there are two great pillars of chapters which occur near the beginning and end of the book, which give in detail the sermons given by the city’s eloquent and intense preacher. Both deal with the basic theological quandary of questioning God’s will and intent. After a particularly devastating scene of death, the city’s leading doctor and the preacher have a philosophical falling-out, in which the doctor refuses to believe in a god that allows an innocent to suffer so. The various schools of thought about Oran and its inhabitants’ condition are not merely referred to, either. As much as an objective observer can, the narrator describes others’ specific responses to imminent death, and it is difficult to fault any of them. One man was here on a business trip for only a few days; is it cowardly for him to want to leave Oran to return to his fiancée? Another, antisocial and obsessive, finds the sense of community brought about by being doomed together heartening; is it selfish for him to feel this way? Many, many things are addressed, and well, in this book. It’s good to read it slow and digest – it can quicken thoughts in you that you didn’t even know you had. I for one still cannot imagine what I would do in that predicament. With all this talk of metaphysical tangents, accounts of sermons, and growing apathy, this book must sound to you like an incredible bore. Not so. The book is beautifully written and translated, and every chapter is a joy. The narrator is very human, but also quite detached and brings with him an incredibly dry sense of humor. Even the minute descriptions of disinfectant procedures and the means of collecting, burying, or burning the dead are pervaded by phrases and observations which bring a smile to the lips. I have to caution, however, that this book is a bit of a commitment. It’s not Ulysses, but the general heaviness does not lend itself to summer poolside reading. Nonetheless, The Plague comes with my highest recommendation. Get ready to get depressed. serve. I’m constructive I’ll be back again yet again and can deliver a number of of my friends.